I just finished taking an illustration class at the California College of Art extension. We had a couple assignments, but I didn't make anything from the first one I felt like sharing. (It was a good exercise though.) The class overall has really helped my thinking about illustration and composition, working with editorial-type assignments, working with deadlines, knowledge regarding the business of illustration, and other great things. This is one of the pieces I did for the final assignment, to illustrate an idiom. 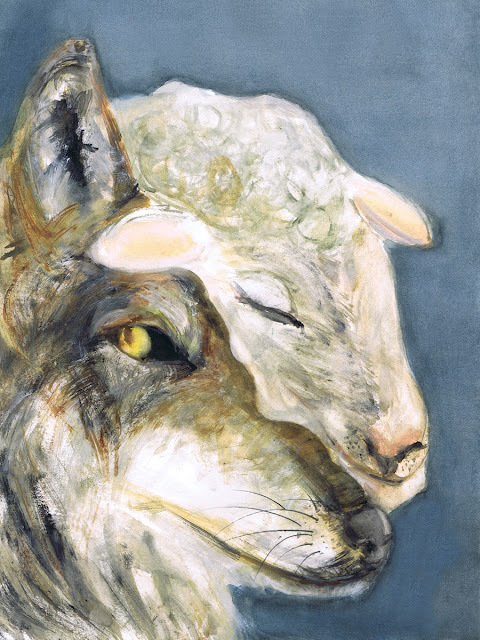 I had a ton of fun depicting the wolf, and I like how creepy the sheep / sheepskin is (though I wouldn't mind it being a bit creepier) but I knew the whole time I was working on it that this was one of the most boring ways I could interpret that assignment! I got close to something with another idiom which I will share soon... I didn't quite finish it before class on Monday and I think this weekend I'm going to try to really finalize the idea. So for now, here's the wolf in sheep's clothing.